In the previous blog post on The Monitor, there was a picture from the Vancouver Sun, with the the Natural Resources Minister Joe Oliver presenting the Harper Government’s “World Class” tanker initiative earlier this week. 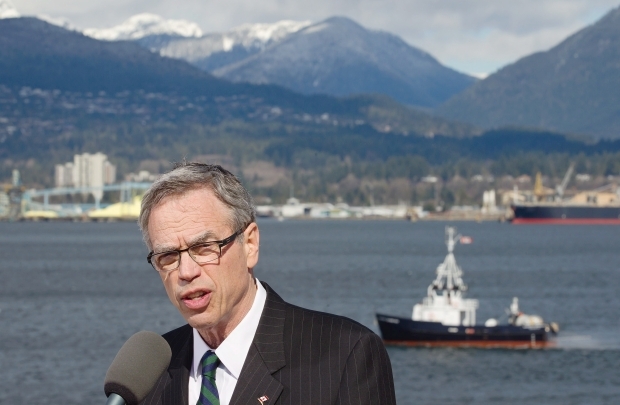 In the background of the picture, there was a small vessel, an oil response vessel, the largest on Canada’s west coast. The Vancouver Sun followed up the Harper Government’s announcement story one day after, with a story highlighting this detail. Turns out the vessel is based in Victoria, and it actually ran aground while on its 11 hrs journey to Vancouver for the photo op. Why this “World Class phraseology”; well because the Provincial leader, Premier Christy Clark has stated that a “world class” class spill response capability is required, before the province will “sign off” on the pipeline project. So the world class photo op was just a typical federal Conservative Party smoke and mirrors show. The truth is the response ship, the Burrard Clean #9 (and with a GT of 105 tons, I use the term “ship” loosely) was stationed 11 hrs sail from Vancouver, currently the most likely place for spill, and it ran aground on the way there. These facts could hardly be characterized as “world class”, well, not in the frame the government was trying to put them in anyways. Read the story from the Vancouver Sun here.